This is part two of a two-part blog on Thermal Mass Flow sensors. 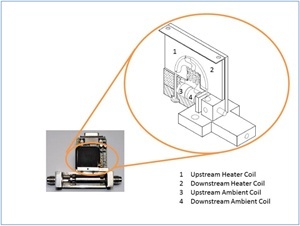 In part one, we described the desired characteristics of a thermal mass flow sensor. In part two, we will discuss the operation of the 300 series flow sensor (Patent #6,125,695) and how its design addresses the desired traits. Associated with each of the two heated coils is an ambient coil. The ambient coil is in excellent thermal contact with the aluminum ambient block. Aluminum has a very high thermal conductivity which ensures that both ends of the sensor tube and the two ambient coils (3 and 4) will be at the same temperature. Two identical Wheatstone resistance bridges are formed from the two pair of coils (see image on right). The circuit shown in the image on the right is designed to ensure that the heated coils (upstream and downstream) are maintained at a constant temperature (ΔT) above the corresponding ambient coils. As gas flow increases in the tube, heat is transferred from the upstream heater to the gas stream. This will force the upstream circuit to use more power to maintain ΔT. In turn, the gas will transfer heat to the downstream heater which will cause the downstream circuit to use less power to maintain ΔT. 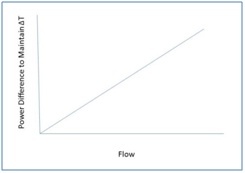 Now, here is the best part: the mass flow rate is directly proportional to the power difference. In other words, LINEARITY! In our previous blog, we discussed how excellent linearity leads to improved accuracy. And, not only does the 300 series sensor give excellent linearity, the circuit shown on the right reacts very fast to changing flow. Thus, the 300 series has excellent responsive time. One last note, we have designed the 300 series to use relatively large diameter tubing. This larger tubing allows flow meters to be designed with lower pressure drop than many mass flow meters on the market. Visit our website for more information on Teledyne Hastings 300 series Flow Meters. Teledyne Hastings' Thermal Mass Flow Sensors are used worldwide. Download our application note on High Throughput Leak Detection to learn about improving lead testing precision and throughput and how to reduce testing time.